convert photo to background image for comic in one click. 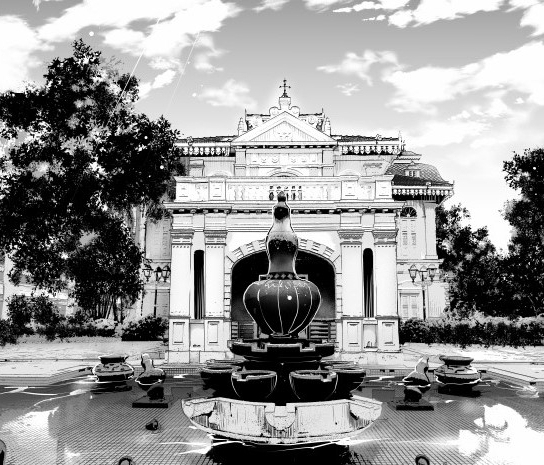 However, the photo looks too realistic and doesn’t not fit in the comic scene. 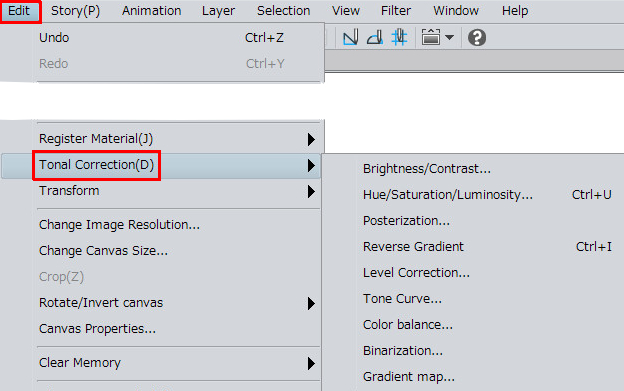 This basic of LT Conversion page will show you how to quickly change photo in to a comic style background. and try to make it faster and more efficient which cannot be done with hand-draw! First, open the LT conversion setting. 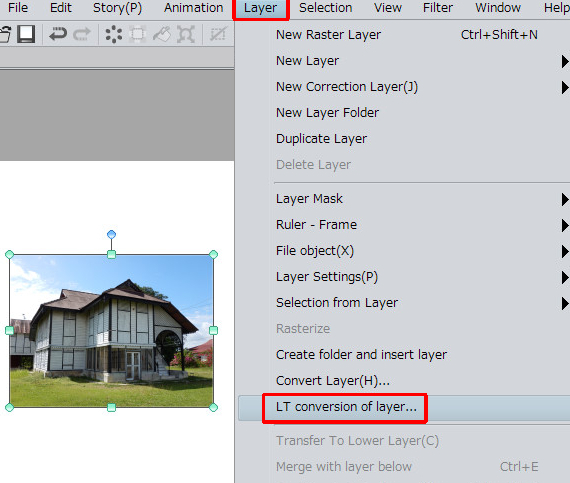 Import the photo material and click Layer tab→ LT conversion of layer. Click here and see how to import photo materials. 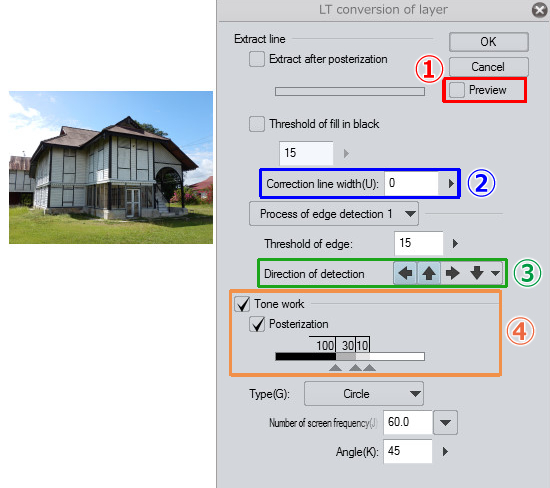 The setting window of LT conversion. It looks like complicated but it’s okay, there are only 4 necessary functions. Well here will explain them one by one. When you check the ①Preview, the photo will be monochrome picture. so be sure to tick first at the beginning. The smaller the number, the narrower the line. The larger the number, the thicker the line. Let’s adjust to the line width that suit your style. ※The line width will become easier to see if untick the ④Tone work. The ③Detection of detection is like a light source setting. Shadow will appear (the line gets thicker) in the direction of the arrow . then it will be done. 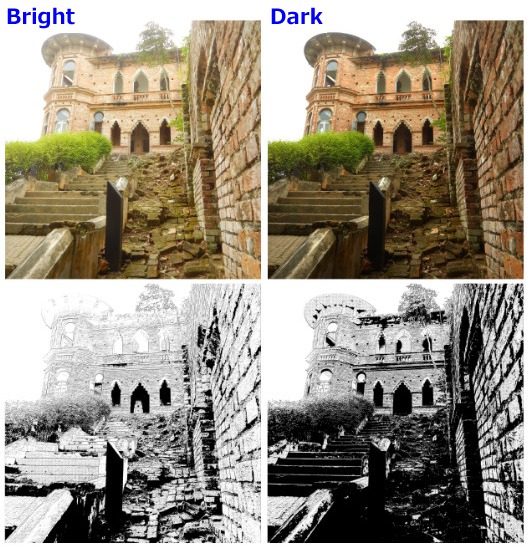 When tick ④Tone work and Posterization, they are automatically set up. 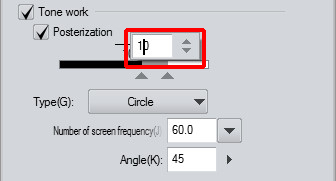 You can adjust the shadow to your liking by sliding the △ symbol. 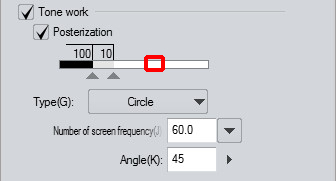 To reduce the number of tones, slide the △ symbol to the right end. To add a tone, hover the mouse cursor over the blank area and click. 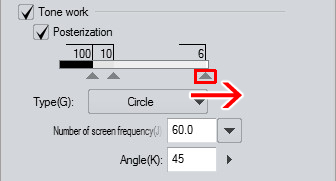 ※Click when the + mark appears in the cursor area. Click the number to change the tone density. 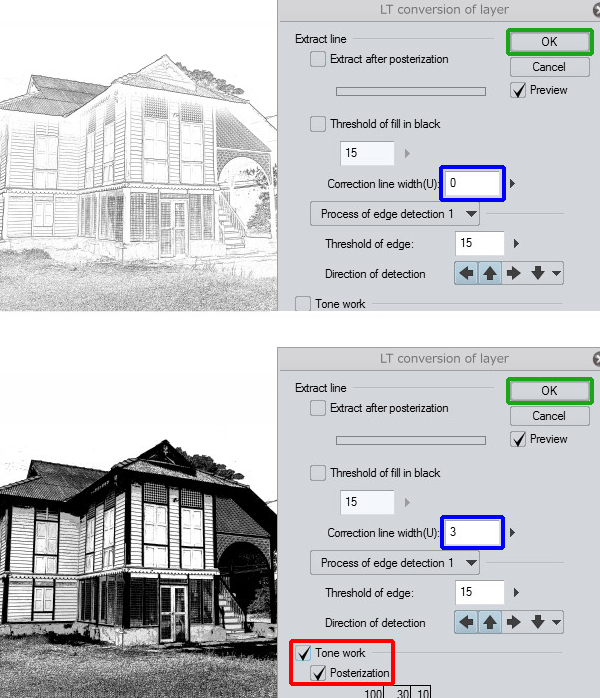 When all adjustment are completed, press OK.
A set of outline (line drawing), tone work and Ground layer were completed with 1 click. When the threshold of fill in black is ticked, the beta will appear. Although it seems convenient at first glance, but the line drawing and beta are identical and cannot be separated. do not tick the threshold of fill in black. In this case, it will be easier to edit later. 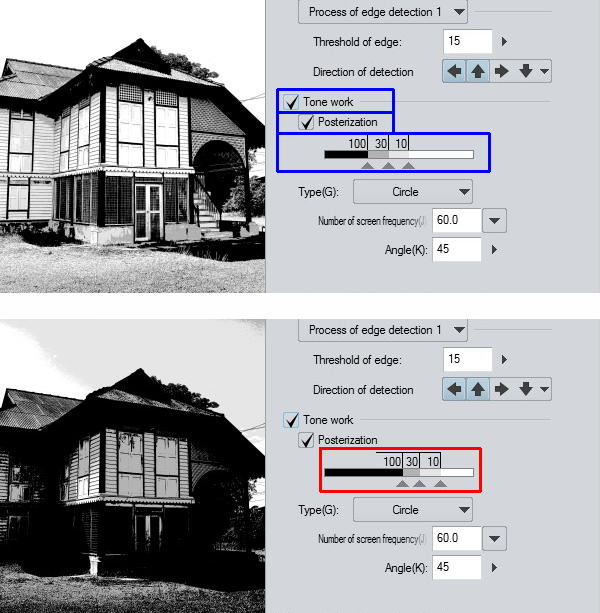 The accuracy of photo LT conversion greatly affects the resolution of the photo. Recommend to use a larger photo image with a resolution greater than 1600px in width. ※The photo image with a resolution around 600px in width are not good for LT conversion. With the density of photo, the impression of LT Conversion can completely change. ・Strong shadows and less to touch up. ・Can’t understand each parts when it’s too dark. ※Examples like the front part of staircase and wall. The accuracy of detection and compatibility of LT Conversion are vary for each photo. It is better to adjust the density according to the scene before LT Conversion. 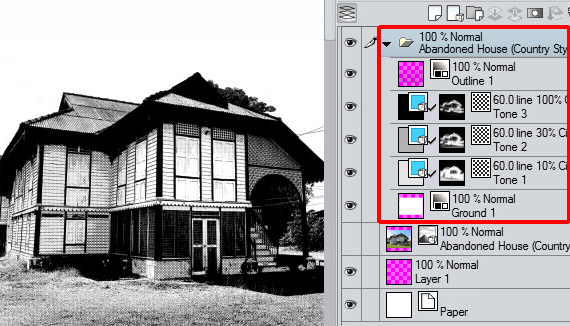 Density and contrast of photo material can be freely processed by Tonal Correction. Please adjust the level correction, tone curve and so on from the Edit tab → Tonal Correction. but the result is too realistic and cannot fit in the character of a comic. Also, it is annoying that accuracy of detection and compatibility of LT Conversion are vary from photo to photo. 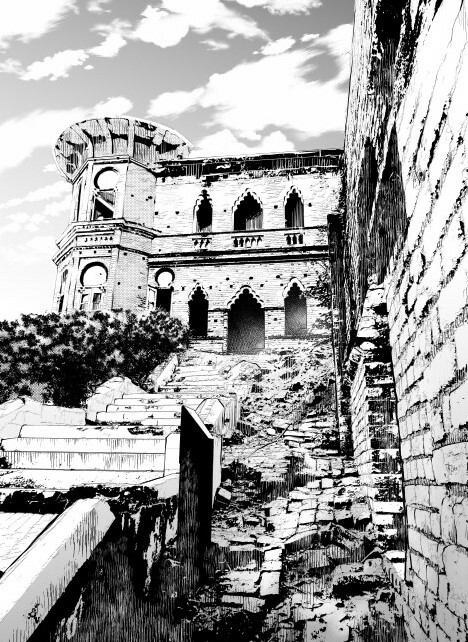 Here will show you come tips to fix the comic style. For some photos, 1 time of LT Conversion may not good enough. So the following example will combines 2 line drawings. 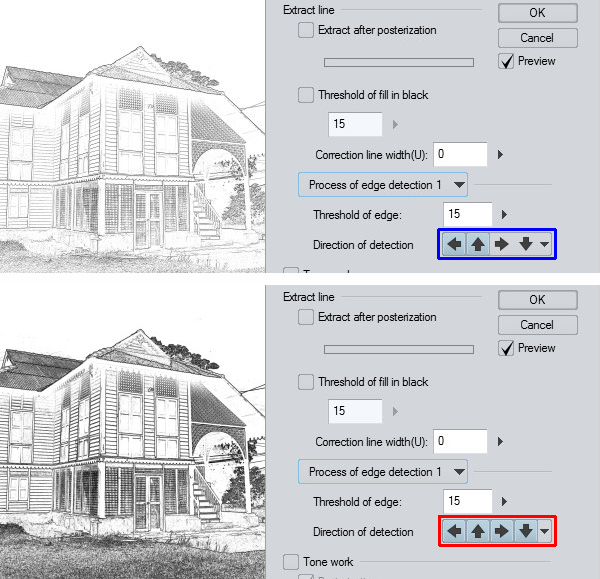 First, set the Correction line width to 0 and remove the tick for Tone work. Then press the OK button to make the 1st main line drawing. Next, set the Correction line width to 3 and tick the Tone work. Then press the OK button to make the 2nd sub line drawing. and correct it with a tone scraping brush. The figure (top ) is main drawing. 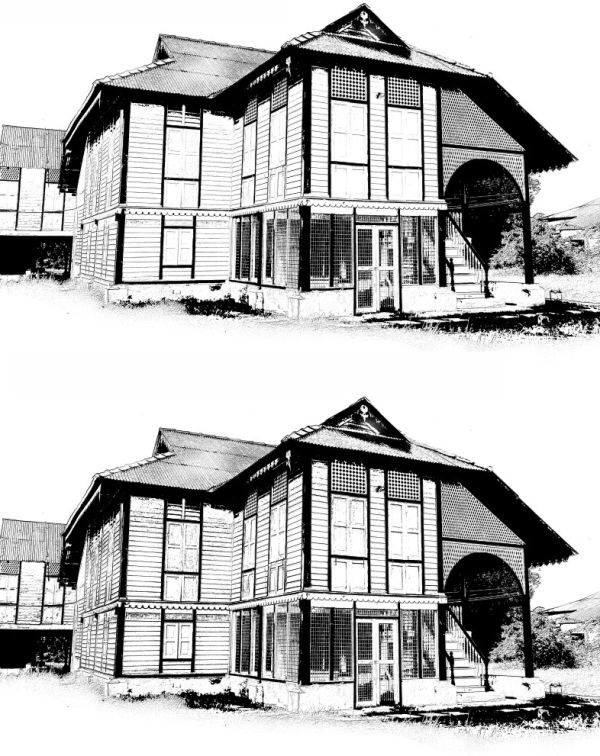 The figure (bottom) is the combination of sub line drawing with the main line drawing. In this way, they can complement the missing parts by placing good parts of 2 line drawings. the key point is delete them all and redraw the plants. Plants can be drawn easily by using brush materials. suit very well with Photo LT Conversion. 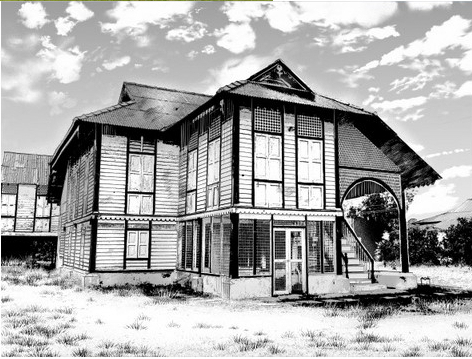 Photo turn to monochrome after LT Conversion have no sharpness of color and it looks blurry. so it becomes difficult to recognize the three dimensional of each part. So this figure are applied with sharpness and contrast. Gradient in the water and sky, beta on the trees. 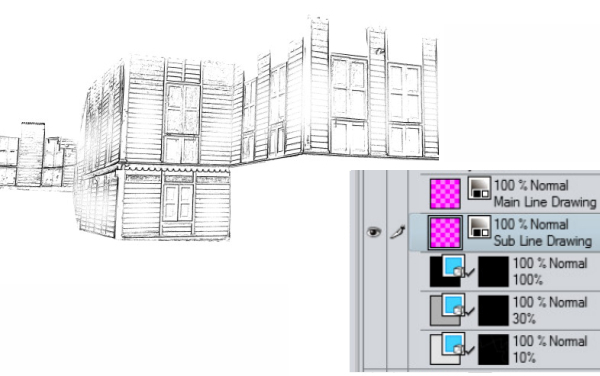 To divide parts firmly, put outlines in the building and the object in front. 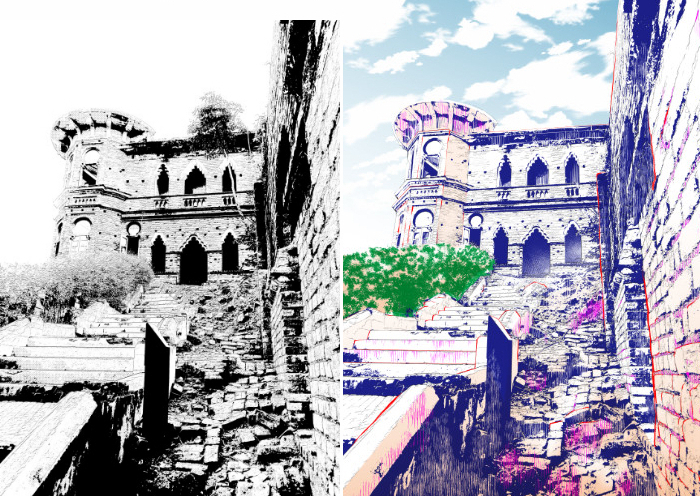 In this way, the photo become comic style. Sharpness and contrast can be applied even with a small number of colors for monochrome. because the amount of light differs depending on the photo. 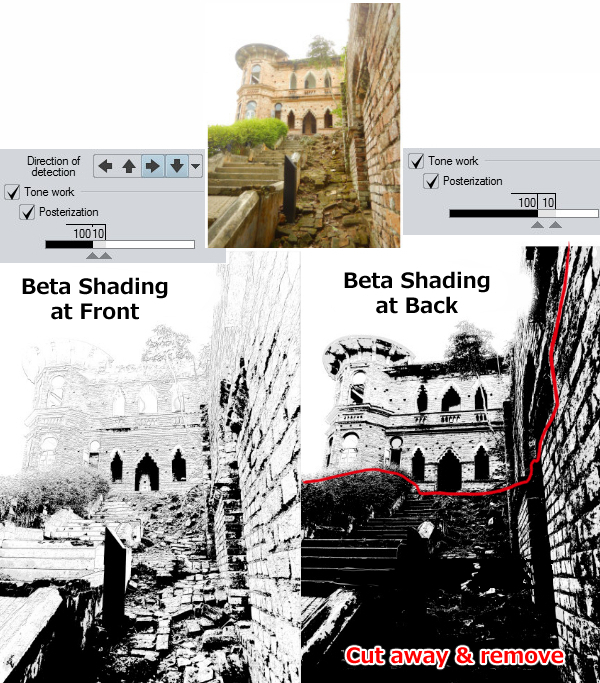 Therefore, the following example combines 2 layers (beta). but the old castle in the back is too thin and it looks like hard to touch up. 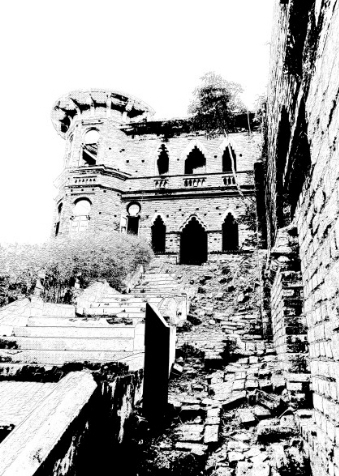 The castle in the back is good but the wall and stairs at front are crushed in black. In this case, combine the 2 layers of beta after LT Conversion. This figure is the combination of 2 layers of beta. Made with good part of shading in the front and back. By using 2 shading like this can greatly reduce tons of touch-up. 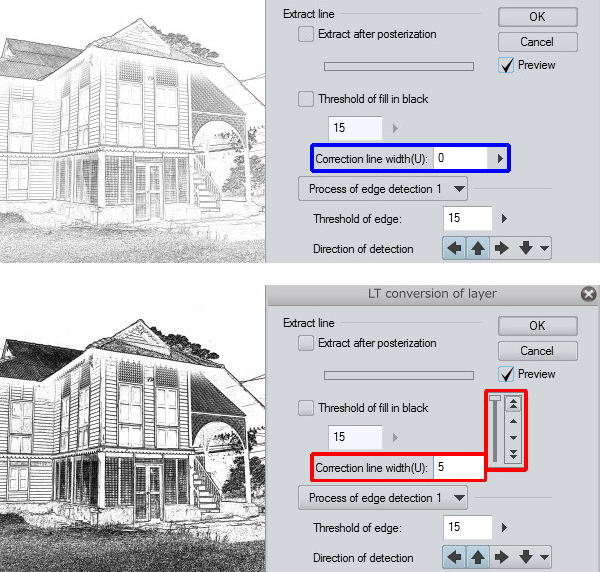 Figures below show 7 tips to make Photo LT Conversion in comic style. ①Remove unnecessary dust with “Remove Dust” filter function. ⑦Put shadow on the surface with tone. ※Please refer to the color of the right figure for each item. because the accuracy and impression of LT Conversion change depending on the photo. This is just only few example. The more idea and skill you have, the more useful it is. Please try them all in your own work.